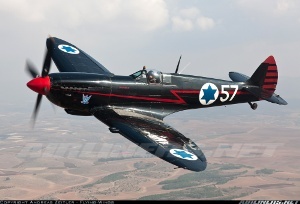 When talking about the "Black Spitfire", the sole example of this classic fighter to be airworthy in the Middle East region, everyone in Israel with an interest in classic airplanes or aviation history refers to it also as "Ezer's Spitfire". By doing so they show their gratitude and refer of course to Ezer Weizmann, who was, amongst many other high ranking positions within the Israeli Defence Forces (IDF), also Defence Minister and later on became President of the State of Israel in 1993. In the light of the phasing out the sale of 30 aircraft to Burma, today's Myanmar, was initiated in 1954/1955, as the P-51 Mustang sucessing the Spitfire has well been introduced into service and also the first jet aircraft for the IAF such as the Meteor or Ouragan were on the horizon. It was that planned sale of Israeli Spitfires that became the birthday of 'Ezer's Spitfire'. Of course only the best parts of the then existing aircraft were chosen to build up the best possible aircraft to keep in the fleet. This subsequently led to a heavy mix in construction numbers all over the airframe, making it difficult to trace back its history to one specific aircraft. The fuselage was taken from the airframe that has been assigned the original "57" code while being in service with the 105 Squadron at Ramat David. Tracing back the history of "57" leads to an entry into RAF service on May, 29th 1945 as TE554 (C/N 17-1351), the registration number this particular aircraft is mostly referred to nowadays. TE554 was then assigned No.310 (Czechoslovak) Squadron, No.13 Group, Fighter command based at Manston, Kent, and flown to Czechoslovakia in August of the same year. Withdrawn from use at some point it was subsequently stored at Pardubice and became part of the patch of aircraft that were sold to Israel in October 1948. After an overhaul at the aircraft factory at Kunovice it was transferred by train and ship to Israel, where it arrived in November 1949. But apart from the fuselage, many other parts for the "57", let it be radiators or other functional parts, were taken based upon which part from which airframe was in the best condition to be donated - as proved by all the different construction numbers that are found on different parts of the aircraft. One prominent example of this approach are the wings, which were originally the clipped E-model wings. During the modification process they were replaced with the elliptic C-model wings of Italian origin, being more stable and better suited for aerobatic flight additionally to having a lower frame time. This is only one example amongst many and clearly shows that they simply took what was best when choosing their special aircraft to be kept in 1954. The following 'accumulation' thus also not only relates to one specific airframe, but reflects more or less the history of all Israeli Spitfires. The origin of the unique black scheme can be traced back to Weizman's personal training days within the RAF. He enlisted in the British Army in 1942 to support the fight against Nazi Germany and one year later he finally got the chance to become a pilot. He joined the RAF where he received pilot training in Rhodesia. At that time one of his instructors had a Spitfire painted in black to be easily recognizable and used this particular aircraft to jump on his trainees after the sorties in order to test their skills. These experiences must have been so deeply embossed in Weizman's mind that there was only one conclusion: the Spitfire that he is going to fly has to be black. Completing the black scheme is the eye-catching red spinner and red stripes on the tail rudder. This originally marked the Spitfires of the famous 101 Squadron, Israel's first fighter wing. As they retained this scheme when the aircraft were transferred to the 105 Squadron at the end of their career, it can be assumed that these squadron markings were retained and overlaid on the black scheme. Tracing back the prominent red flash along the fuselage might lead to the commanders aircraft of the Squadron, Spitfire Mk.IX "2058/58". This particular aircraft was the only aircraft that did not wear any camouflage, but a very distinctive scheme: overall silver with a red flash on both sides of the fuselage. This scheme had its origins already in Czechoslovakia and it is possible that the red flash as a sign of the commander was transferred to "57", as "58" was amongst those aircraft that were sold to Burma. The red on the underwing coolers that can be seen nowadays was only applied during a recent inspection and not be seen on the original aircraft. All this has been more than 55 years ago, and the Spitfire is fortunately still going strong! Flying it is of course a rare occasion, but during the whole year approximately 40 sorties are performed, most of them in preparation for and during the graduation ceremonies for new Air Force pilots at Hatzerim each half year. The remaining flights are during the Israeli holidays when the historic aircraft are flown in a small display above the museum for the visitors. It is in the trusted hand of Dedi Rosenthal, a former IAF pilot who has fought aerial battles in F-15s and F-16s. But even flying these high performance jets he is of the opinion that the Spitfire is "the Queen of the skies" and "flies like hell!". When looking at his fruitful military career in retrospective, Dedi still prefers to fly the Spitfire. Contrary to many other aircraft the Spitfire has a soul and "you feel the wings of history when sitting in this aircraft". Thus 64 years after its arrival in Israel, the Spitfire is still regarded by many the Queen of the Skies and will last so for long! Thanks go out to everyone who was involved in getting this photoflight arranged and done as well as those hard-working people who keep this Spitfire in the air!